Trent University sociology professor Dr. Jim Cosgrave recently published a new book exploring the social impacts of gambling entitled Casino State: Legalized Gambling in Canada. “Profits from casino gambling have been crucial for government budgets in many provinces, and, in the face of the current economic crisis, it’s increasingly important to consider the social costs of legalized gambling,” stated Professor Cosgrave, who co-edited and contributed several chapters to this new book released by the University of Toronto Press. “When governments get into the gambling business, they face perceptions of their legitimacy, and this is more significant in relation to the phenomenon of problem gambling, which is a consequence of gambling-friendly policies. In times of economic uncertainty, it’s even more important to examine the real price of these policies,” Prof. Cosgrave said. Prof. Cosgrave noted that the book is a response to an “unprecedented explosion” of legalized gambling, particularly in the form of casinos and electronic gaming. It includes a chapter dealing specifically with the latter, other issues, such as gambling and morality, gambling consumption and risk, provincial policies, and social issues such as gambling-related crime and youth problem gambling. 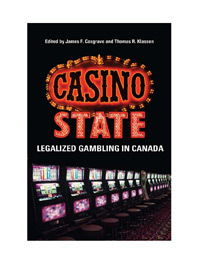 The volume raises questions about state conduct, policy issues, public health and addictions, and provides a comprehensive overview of the central issues related to the legalization and expansion of gambling in Canada. Prof. Cosgrave teaches at Trent University’s Oshawa campus. Fellow co-editor of Casino State with Prof. Cosgrave is Thomas R. Klassen, a political scientist at York University. For more information about studying sociology at Trent, click here. Posted on Tuesday, February 10, 2009.